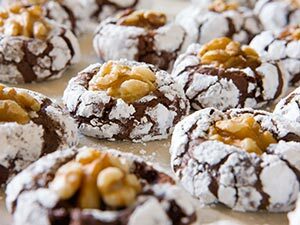 Chocolate cookies always are a customer favorite and this recipe makes it easy to win fans. Just mix, scoop and bake. 1. Melt chocolate and butter together in top of a double boiler set over simmering water. Whisk until smooth. 2. In large bowl, mix together flour, cocoa powder, baking powder and salt. 3. In bowl of an electric mixer, beat eggs and sugar for 2 minutes. Reduce to low speed; fold in melted chocolate, coffee and vanilla. Add flour mixture; beat on low speed just until blended. Refrigerate dough until firm, about 1 hour. 4. Preheat oven to 350 F. Scoop or form cookie dough into balls, each about 1 tablespoon. 5. Place confectioners’ sugar in bowl; roll each of the dough balls in sugar. Place on parchment lined baking sheets several inches apart. 6. Bake 13 to 15 minutes until crackled on top. Remove from oven and gently press a walnut half in middle of each warm cookie. Cool on wire racks.